When Louis first heard guitar, at age 10, it was an instant attraction: seizing his mother's old guitar, he started playing music straightaway. Within a few months, his skills growing dramatically, he moved on to a concert Ramirez. Soon, he was working on the same pieces as his teacher, such as Bach, Villa-Lobos or Brower pieces. Two years later- Louis was now 13- his teacher decided it was time for him to study with Oscar Caceres at the European Conservatory of Music, which was an immense and absorbing honor. But when Caceres requested that Louis quit junior high and focus exclusively on music, he refused, and left the conservatory. 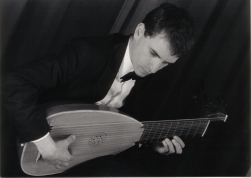 Fascinated by the Baroque period, Louis began the lute- he was not yet fifteen. He started out by poring over musical research documents describing the antique music, gleaning whatever practical information he could. 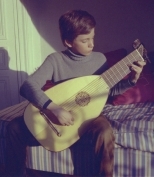 On the eve of his confirmation, he received what would become a lifelong passion: his first baroque lute. Working with another young enthusiast, Kleber Besson, his technique grew. 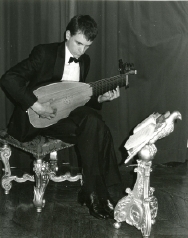 Three times a day all through high school, the lute was as regular as meals. 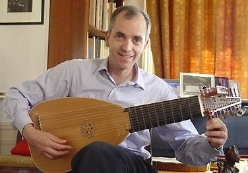 Louis played lute, theorbo and a 1927 folk guitar he had adopted on his first visit to New York to play blues. At nineteen, Louis finally met the man who would be his true master: Antoine Geoffroy-Dechaume. A demanding teacher, Geoffroy-Dechaume accepted nothing less than perfection from his young pupil. At twenty, Louis decided to become a Minister in the protestant reformed church, and considered giving up the time-consuming professional study of music. Thankfully for us, he finally decided otherwise. He studied theology, philosophy, hebrew and ancient greek- but he still studied the lute and ancient music interpretation. For the next ten years, Louis worked faifthfully with Geoffroy-Dechaume, preparing concerts and two disks (Dufaut and Gaultier). For musical scripture, Louis would often request micro-films from specialized libraries such as the Berlin library. 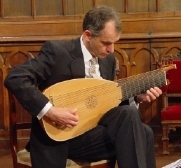 Louis' instruments were progressing also: first a Renaissance lute, then Baroque, a theorbo, and finally, custom-made instruments by the great lute maker Jacob Van de Geest, who custom-built for him a baroque lute and an archilute. Louis' reputation spread, at first within lute specialists; then more widely within baroque specialists and the wider circle of classical music lovers. His first concert was a 200-seat room. On his second concert, the national press came and wrote the praise you can read in the "press" section. From then on, Louis was known as a rising star of French baroque musique, and of Bach. He was often heard on national radio; and invited to play with baroque orchestras. In 1984 EMI records chose him to be their lute master of their Treasury of Bach; this box set included pieces with every instrument Bach has written for. By then, Louis was playing in the Saint Chapel in Paris. He then recorded the Dufaut disc in a small chapel in Switzerland. Louis also started playing harpsichord, organ and french hunting horn on the side. In 1989, a subsidiary of Universal Music requested a worldwide first: the recording of the "Divine Rhethoric", by Gaultier. The same year, national television produced a 30 minute documentary about Louis, the "Musician Minister": Louis was indeed a minister, but also an engineer and a PhD. in philosophy. From then on, Louis continuted his personal research, in antique books, which his how he stumbled upon Perrine's two treasures. Louis paid much attention to the fact that all pieces were written to be danced on. That's why Louis played often with baroque dancers who were delighted to find a disciple of Geoffroy-Dechaume, whose research was in a perfect accordance whith the choregraphic research on baroque dance. Even when no dancers are present, the character of the piece should be recognised immediatly just as today we would know if a piece is tango or waltz. For the past ten years, Louis has been working incessantly on his latest masterpiece, the "Book of Perrine", recorded in Switzerland, which will finally be released in a few months. This recording is the apotheosis of his work, and is impatiently awaited by his fans.